To win best cafe in Sydney, one of the most developed cities in the world, is no mean feat. 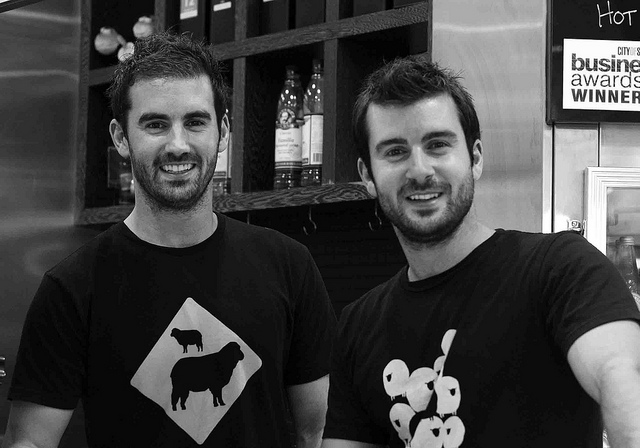 So I thought it was high time to interview Dave and Adam Wright, owners of my daily coffee haunt the two black sheep, in an Innovate or Die exclusive. Where did the name two black sheep come from? Initially, the shop was called ‘Espresso Bar’ – a name we inherited, which is more of a description than an identity. We decided that we were probably the least creative people we know, so we handed the task over to our customers. We ran a competition called the ‘Your Name Here’ competition, where customers submitted their ideas (and email addresses) to go in the draw to win 30 free coffees or a $100 iTunes voucher. We were inundated with suggestions, and eventually landed on two black sheep. Who is your target market and what is special about them? Our target market is the corporate office worker who works long hours and is always running late. We cater our whole business model to suit the expectations of city workers – high quality and fast. We have especially designed our shop layout and workflow systems to provide great coffee efficiently, no matter how busy we are. Our target market is special because if we are able to get our product and service right, they will more than likely buy more than one coffee a day. Because they’re generally going straight back to the office, they have an opportunity to discuss their experience with colleagues immediately. How is two black sheep different to every other coffee shop in Sydney? We are the only café that aims to be a ‘coffee concierge’. We believe great service and product consistency is hard to come by, despite being the fundamentals of the hospitality industry. We have a unique brand which now reflects service and quality, but with a light hearted sense of humour which has helped create the community we now have around our business. What’s behind the partnerships with Brasserie Bread and Charlie’s Juices? When we launched our brand, we were always going to offer a premium range of products. This started with our coffee, but as we began to sell more and more toast we wanted to align ourselves with a premium artisan bread company. Brasserie Bread was the obvious choice – they are the best at what they do, and they compliment our brand. Charlies is much the same – they have a very high quality product and have positioned themselves at the premium end of the juice market. Being from New Zealand, we were already familiar with their brand and their innovative marketing. Many people dream about starting a coffee shop, only to close down within a year of opening. Why do you think you have you been so successful? People like the idea of owning a café and often think it is a lifestyle choice – an assumption that couldn’t be further from the truth! We immediately made sure we had experienced people around us that understood where we wanted to go, and were excited to come with us. Our staff retention rate has been great, especially in such a fickle industry. The other main challenge is to be adaptable and constantly change. We think many people are resistant to change in whatever form, but we have made a point of making change part of the status quo – our goal is to change something in the business every two weeks. This not only keeps things interesting, but it doesn’t allow the business to be stagnant. You were named Café of the Year at the 2010 City of Sydney Business Awards. What does this mean for you, your business and your customers? The award was a great validation for what we have been doing, it meant so much to know we are on the right track with our business. Our staff are the ones who served the mystery shoppers and uphold our values on a day to day basis, and they are proud of the fact they work in an award winning café. It is now a great challenge for all of us to maintain the reputation that the award brings. For our customers, it certainly strengthened their confidence in us and what we do. The award also attracted many more customers who wanted to check us out. Your sandwich selection has unique Kiwi names. What’s the thinking behind this? We wanted to keep the kiwi theme going and do something different. We could have just called the chicken option ‘Lemon and herb chicken’ but by calling it ‘the whenuapai’ we get customers talking and asking us questions. It is also amusing hearing Aussies try to pronounce the Maori words. The pre-pay cards are pretty unique in the market. Tell us a bit about these and the % of coffee sales they are delivering. Initially it came down to a workflow issue – counting change during the morning rush. We only had one cash register and the line in the morning can be pretty long at times, so to speed it up we wanted to eliminate money all together for as many customers as possible making things easier for customers and us. We also give a 15% discount for using the cards so our customers love them. We now have the majority of our regular customers using the cards. We estimate around 25% of our customers use the prepay card regularly. You have recently made the move into the online space, with online ordering, merchandise etc. How is this going? We’re really happy with our new website and we’ve had great feedback. The challenge now is to market the site and build the online sales – an area we are still learning about and taking lots of advice on. At the moment we are testing a measuring different online advertising options and planning to run some exciting campaigns through the shop to push people to the site. So far we have found Facebook advertising an effective way to grow our online presence quickly and are learning quickly about how important key words and images are in the online space. How are you marketing two black sheep? In our industry word of mouth is very important, and we ensure our staff are trained to maintain high standards on the premise that they will tell their friends. We are now marketing our business more aggressively through our own custom blend of coffee which is already beginning to get a good reputation. Facebook and twitter are very useful communication tools and an easy way to market our website to the fan base. Merchandise is another avenue we have explored, selling our own line of designer t shirts as well as branded keep cups which market two black sheep on someone’s desk to their colleagues every day. We have also done a number of charity events such as Movember and Running for the Rainforest (where we ran the SMH Half Marathon for Rainforest Rescue wearing custom TBS running shirts) or even thrown out free coffee cards to the masses at the Movember Gala party. We are slowly building a database which we intend using to market directly online, but this is a work in progress at present. We use Facebook and Twitter for a number of reasons. Firstly, we communicate specials and new products. We try and comment on current events, show our customers how much we love them, or banter with them about hot topics, especially if it involves an ANZAC sporting fixture! Secondly, we try and drive them to the website by advertising products on our Facebook page which they can purchase in store or online. What’s next for two black sheep? We plan to launch TBS Airlines, TBS Hotels, TBS Cola and even TBS Condoms, all by 2025. We have also had customer requests for a TBS underwear line, so we will see what the marketing department decides is the number one priority. Outside of that we are investigating wholesaling and licensing options. Finally, what is one piece of advice you would give to someone wanting to open their own coffee shop? Get great people around you and pay them what they are worth. A great team will make all the difference when you’re going through the inevitable challenges that pop up unexpectedly. Heed advice, treat your customers like gold and never think you know it all, there are a lot of experts out there who can give you crucial tips to a quality formula.